I like to have some kind of bread with every dinner. And when I saw this recipe for Garlic Parmesan Skillet Bread, I knew I had to make it right away. And after trying it, I am sooo glad that I did! Melt butter in saute pan. Add garlic, parmesan cheese and Italian seasoning. Cut biscuits into quarters and toss in OVEN SAFE saute pan (or a 9" cake pan). Place whole pan in oven and bake for 15-20 minutes. Remove from oven and slide onto platter for serving. I love parmesan bread. 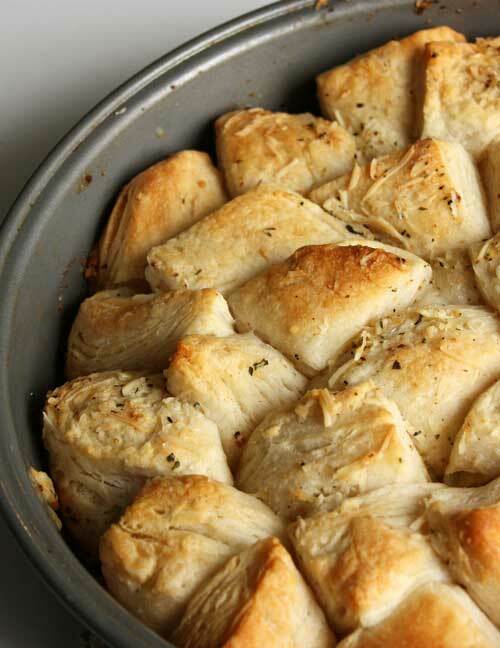 With using canned biscuits, this recipe makes preparation quicker and clean up easier.